Looky, Wookiees, it’s Chewy cupcakes. OK, enough with the bad jokes. I made more than three dozen of these Chewbacca cupcakes for my Star Wars fan son to take to his kindergarten class — enough to span 12 parsecs. If you want to make these Chewbacca cupcakes more quickly, just skip the “furry” part and frost them in a smooth layer of chocolate. 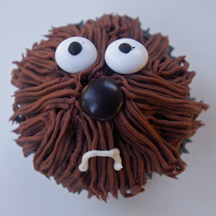 This is a variation of a Chewbacca cupcake I saw online. How to Make It: Frost cupcake with a thin layer of chocolate frosting. Put chocolate icing in pastry bag affixed with #233 metal tip. Use tip to make long strands that overlap for a furry effect. Squeeze a dot of black writing icing onto white M&Ms for eyes and place on cupcake. Add black M&M nose. Use white icing and round tip to “draw” a mouth and/or teeth. This entry was posted on Friday, October 16th, 2009 at 9:50 am	and is filed under character cupcakes. You can follow any responses to this entry through the RSS 2.0 feed. Responses are currently closed, but you can trackback from your own site.